While it might seem like the ultimate healthy fast food to those of us used to grabbing a tray on the go, sushi is something of an artform in Japan and a sushi chef will train for several years before they can call themselves adequately qualified. 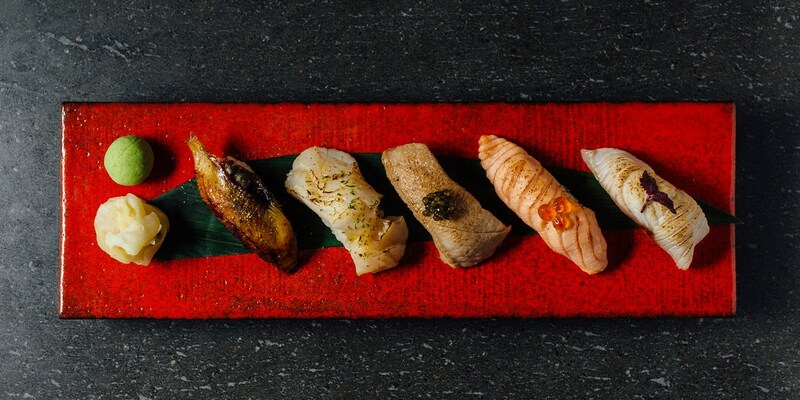 The Japanese term zushi has been in use for hundreds of years, but it is the rice and fish preparation created in the Edo period that is closest to the sushi eaten today. It is a sign of the dish's popularity around the world that uramaki (inside-out roll) and California rolls are now as common a fixture on sushi menus (in Western restaurants, at least) as oshizushi (pressed sushi), futomaki (fat rolls), nigirizushi (hand-pressed sushi) and temaki (hand rolls). Discover how to make sushi at home with this stunning collection of recipes. Hideki Hiwatashi's Salmon nigiri includes a simple sushi rice recipe that can be used with any manner of toppings and fillings, while his Hamachi sashimi is an exquisitely elegant dish that, while simple to prepare, makes a striking seafood starter. Georgina Fuggle's inside-out sushi recipe is packed with sliced avocado and smoked salmon – perfect for those a little nervous of raw sushi – while Louise Robinson's fantastic bento box is loaded with neat rows of prawn nigiri.